There's a treasure hunt for buried treasure in this worksheet. 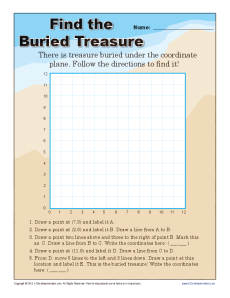 Your student will follow the directions to locate the treasure on a coordinate plane. It's a fun way to practice Common Core Standards or 5th grade Geometry. It's also helpful for other grades.